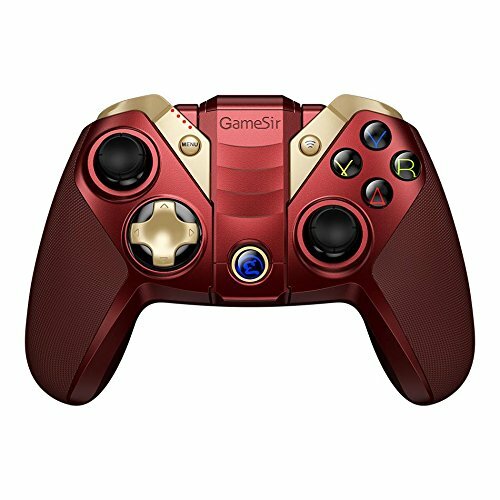 Introducing GameSir M2, the Apple-Certified MFi wireless gaming controller that gives you the power to use your iPhone as a handheld game console. This gamepad is famous for its ergonomics design measuring at 155 mm width, 102 mm height, and 65.5 mm depth. This controller comes with rubber-coated textured handles to enhance the grip. Gamers can enjoy incredible precision and reaction speed when playing adventurous games. Players also have the option of using iPhone, iPad, Mac and Apple TV. Playing iOS games can't be easier than ever! Hassle-free experience to play the game. Simply use GameSir M2 to connect to your iOS devices via wireless, without additional settings, you are free to control your favorite game right away! Download GameSir World (iOS version) and browse a thousand of Apple gamepad supported the mobile game! PLEASE NOTE: This MFI Controller does NOT work for PUBG and Fortnite. Esport-level professional gaming experience for shooting / fighting / action / sport games. wireless 4.0 lag-free connectivity, fantastic LED lighting crystal buttons. The Premium buttons with 256 levels of pressure sensitivity providing precise gaming control. Built-in smartphone bracket holder, mount you phone easily and play anywhere outdoor.